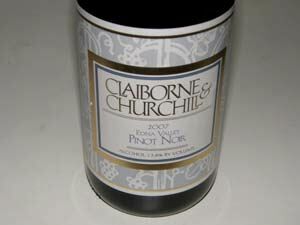 This family owned winery was founded in 1983 by Claiborne (Clay) Thompson and Fredericka Churchill Thompson. Locate in the Edna Valley, this producers has gained notoriety for its Alsatian varietals including Riesling, Gewürztraminer and Pinot Gris, but more recently Pinot Noir has also become a signature wine. The winery, constructed in 1995, is a straw bale building, the first of its kind in California. The winemaker is Coby Parker-Garcia. The winery's Edna Valley Pinot Noir is sourced from Twin Creeks Vineyard and Wolff Vineyards. A very solid wine that is value priced. Available on the website.